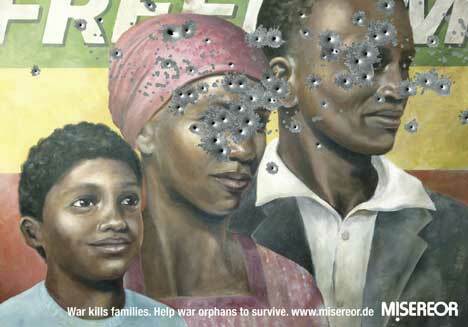 Misereor, the overseas development agency of the Catholic Church in Germany, placed these print advertisements as a reminder of the impact of war on orphans around the world. 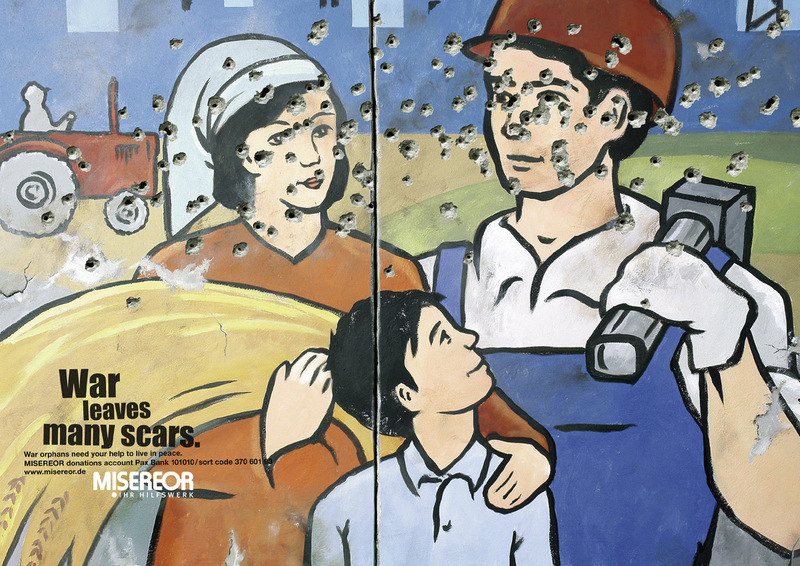 The faces of adults on murals or billboards, from locations in Somalia, Iraq and Chechnya, are disfigured by bullet holes. 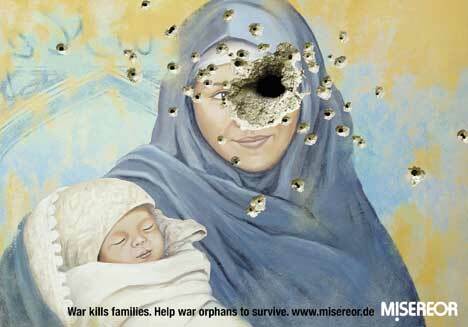 The text on each print advertisement: “War kills families. 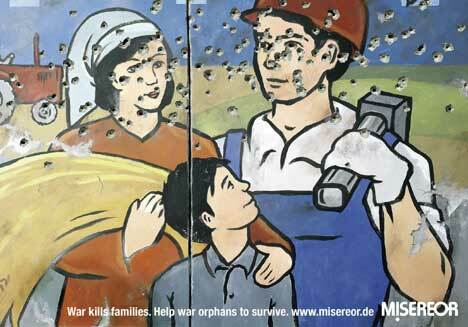 Help war orphans to survive. www.misereor.de”. The Iraq version, with the woman in blue, has the feel of a Madonna and Child painting. 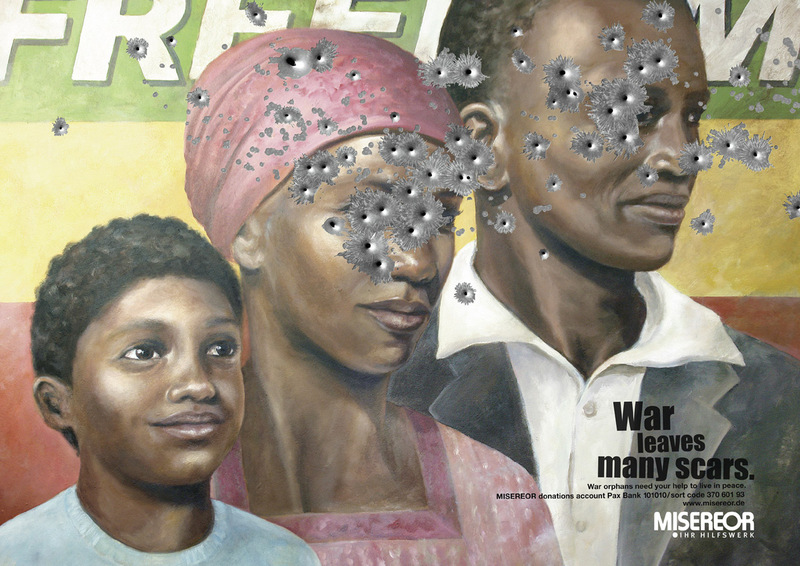 Click on each of the images below to see the magazine version, with the text, “War leaves many scars. War orphans need your help to live in peace”, and the bank details for donations. The Misereor campaign was developed at Kolle Rebbe, by creative directors Sven Klohk and Lorenz Ritter, art directors Maik Beimdiek and Jens Lausenmeyer, copywriter Elena Bartrina y Manns, account managers Alexander Duve and Jessica Gustaffson. Illustration was provided by Eva Salzmann with image manipulator Kathrin Meske. Miseror marketing manager was Georg Larscheid. 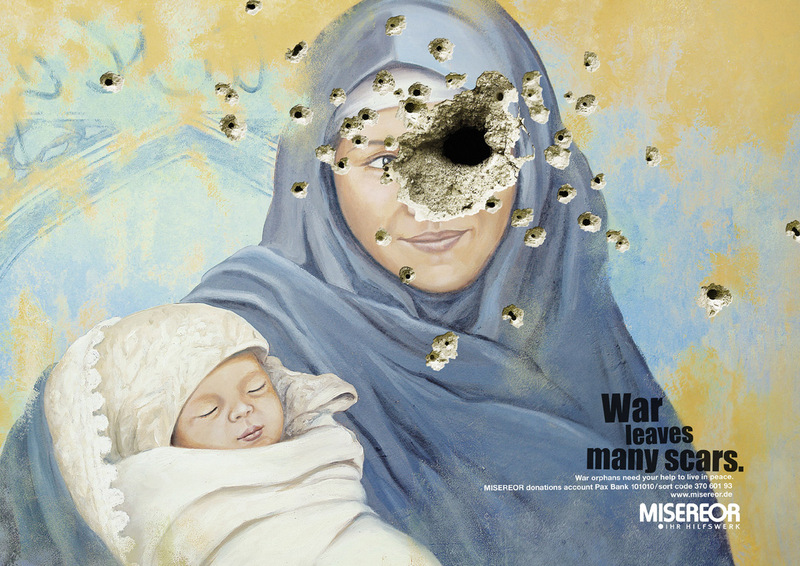 These War Orphans campaign won the Black Pencil for best illustration at the D&AD, Gold at the Epica Awards 2007, bronze for fundraising and appeals at Cannes 2007, bronze for philanthropic appeals at the New York Festivals International Advertising Awards, 2007, gold for illustration and photography at the Art Directors Club of Europe, bronze for fundraising and appeals at Eurobest 2007.